Contrary to popular belief, KNILM (Royal Netherlands Indies Aviation Company) was NOT a KLM subsidiary. It was founded on July 16, 1928 as NILM by a group of 32 Netherlands Indies investors with a capitalization of NLG 5 million. To prevent confusion with an existing insurance company (Nillmij) Queen Wilhelmina awarded the Koninklijk (Royal) title on October 15, 1928. November 1, 1928 saw the inauguration ceremony of services between Batavia – Bandung, and Batavia – Semarang. Nov 1, 1928. Departure of the first scheduled KNILM flights from Batavia to Bandung and Semarang,The aircraft still bearing the Dutch (H-N…) registrations. 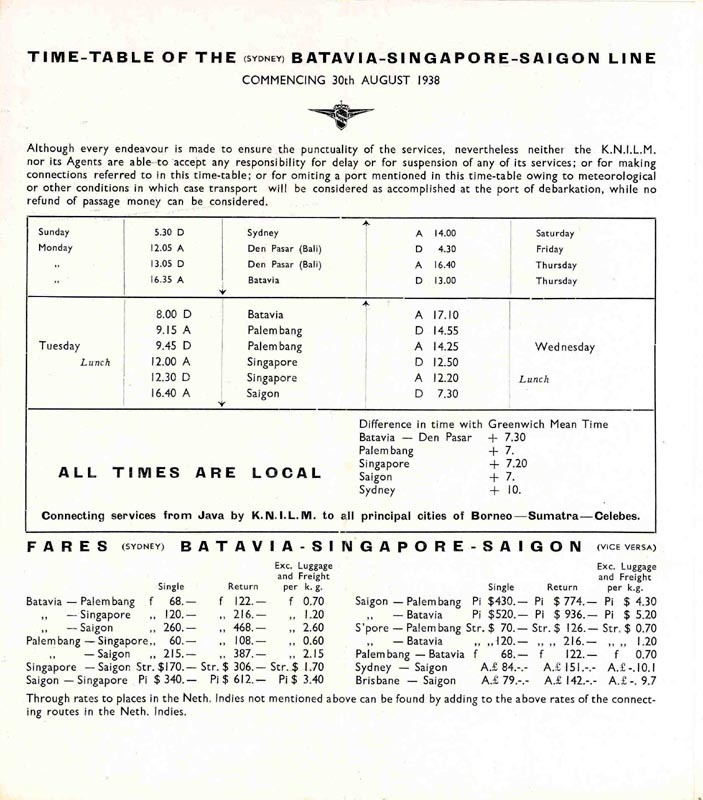 As early as 1930, KNILM began its first international flights to Singapore but did not fly to the Netherlands, as the Amsterdam-Batavia weekly service was operated by KLM. On July 3, 1938 KNILM opened the route to Sydney, via Darwin, Cloncurry and Charleville. 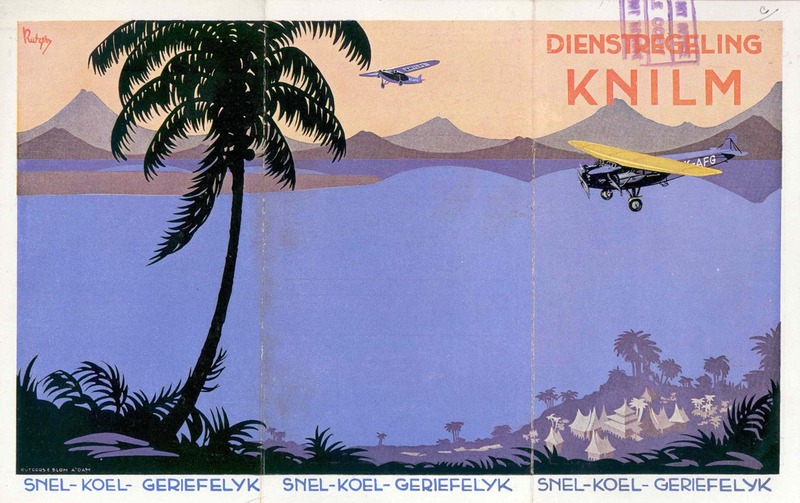 Of course the KLM – KNILM combination faced stiff opposition from Britain’s Imperial Airways in the mid-1930s, the British trying to dominate the air routes to the far reaches of the Dutch and British colonial empires. Imperial Airways already had commitments to serve a large number of points across Asia—all of which included passenger, mail, and freight services. As a result its resources were stretched to the limit and the airline could not offer the kind of reliable and high quality service that KLM could provide to a few key locations in Asia. The fight with Imperial Airways for the air routes into Asia was long and bitter. The British, with their huge empire, were trying to block the Dutch in key routes by denying them the passage of “overflight” or by cooperative agreements with other national airlines to prevent KLM from taking business away from Imperial Airways. Despite all this, by June 1938, KLM and KNILM were offering an eight-day service from Amsterdam to Sydney, Australia. For many business travellers, KLM was the most convenient way to travel to the Far East. During the last years preceding the Pacific War, KNILM also created a network in the eastern part of the East Indies archipelago, serving towns such as Ambon. These services were carried out by amphibious aircraft due to the lack of airstrips in the region. In 1941 KNILM started a Kupang to Dilli service on behalf of the Portuguese Timor airline Servico Area da Colonia de Timur. This service was considered important from a political and military perspective and was continued even though the Portuguese government failed to pay for it! A few weeks after the outbreak of the Pacific war KNILM services were taken over by the military. It soon became clear the Japanese invasion was going to reach Java and on February 19 and 20, 1942 KNILM evacuated the majority of its key personnel to Australia. When the Japanese invasion of Java took place on March 1, 1942, all remaining KNILM aircraft with sufficient range were evacuated to Australia. During the night of March 7, 1942, one day before the capitulation of Java, the last KNILM aircraft took off from the Buabatu Road in Bandung. With eleven aircraft evacuated to Australia (two DC-2, two DC-3, three DC-5 and four Lockheed 14) KNILM possessed a significant component of the country’s meagre air transport fleet. KNILM initially operated their aircraft under charter to the U.S. military but General MacArthur was reluctant to allow so many valuable aircraft to remain in civilian hands. As a result, KNILM were coerced into selling their aircraft to the USAAF. This coercion took the form of a suspension of logistical support (such as the impounding of one hundred cases of spare parts) Surviving documents suggest that all of the KNILM aircraft were to have been sold to the Australian government for a token £5 each, but the transaction was apparently overruled in favour of a sale to the USAAF. This purchase is reputed to have cost Uncle Sam US$ 493,683 for ten aircraft (one Lockheed 14 had been written off). Under the terms of the contract, KNILM were required to test fly all their aircraft before the handover to the USAAF. As a manifestation of their outrage at having to surrender the aircraft for which they had fought so hard, the KNILM staff resolved to have all ten aircraft ready for a spectacular test flight over Sydney Harbour on 14 May 1942. After several aircraft buzzed the Dutch destroyer “Tromp”, a DC-2, a DC-3 and a DC-5 lined up on another target – the Sydney Harbour Bridge! In line astern, the formation proceeded to fly under the Bridge, once in each direction. Australian authorities were furious and threatened large fines to any airman who would dare to do this again! In the meantime KNILM established a head office in Sydney but, since all available aircraft had gone and there would be no operations, this office was relocated to New York in March 1943. In anticipation of the post-war developments, the Netherlands government in London decided to separate KLM and KNILM management. KNILM responsibility for KLM operations ceased on 15 September 1943 when a new KLM management was installed. At the end of the Pacific war, KNILM director ‘Willem’ Versteegh frantically tried to rebuild his airline but political interference prevented KNILM to re-emerge. 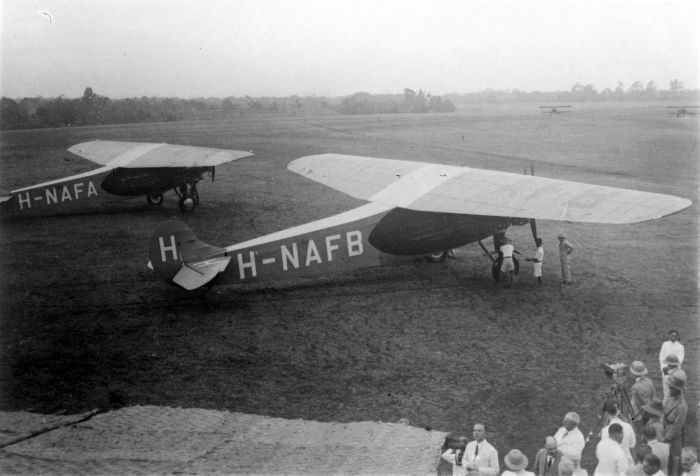 Its Dutch East Indies domestic network was handed over to a quasi-government organisation known as the Netherlands Indies Government Air Transport (NIGAT), that operated military aircraft with quasi-civilian (Australian) registrations. A weekly trans-pacific flight from Batavia to Los Angeles was launched on November 16, 1946. It was crewed by military personnel and flown by NIGAT owned aircraft under the guise of a KNILM experimental service. The end came when, on August 1, 1947, the Dutch government decided all NIGAT operations were to be taken over by a new KLM subsidiary, called KLM Interinsulair Bedrijf (Inter-Insular Services) Since KLM was the designated long-distance Flag-Carrier, the experimental service to Los Angeles was to be terminated. KNILM had ceased to exist. The aircraft were bought by H.Q.U.S. Army Air Service Melbourne for the price of US$493,683. Thanks Ronald. I have corrected the amount. I will have to check my files on this Dakota. However Captain Eddy Dunlop was an old time KNILM captain who actually piloted the last flight out of Bandung on March 8, 1942 carrying the deputy governor-general (Huub van Mook) to safety in Australia. In 1946 KNILM was in the process of being “resurrected”, all transport being under military control. The cornerstone was no. 19 (NEI) sqn that flew Dakota’s from various bases in Australia. 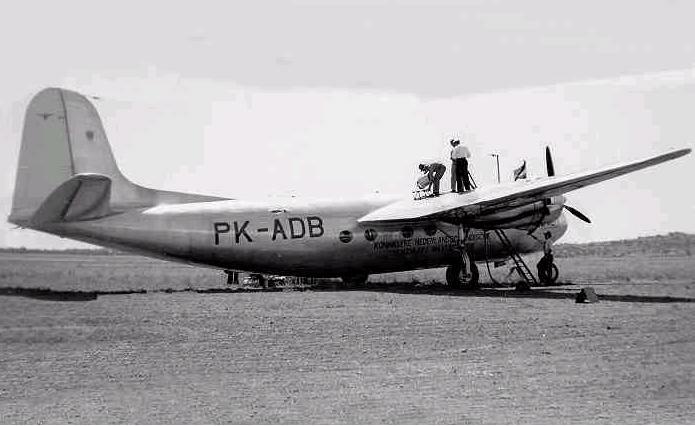 For a number of years the Dutch in Indonesia flew Dakotas with Australian civilian registrations. I will collect some more information and dedicate a post to this subject. Hi Robert, many thanks for your reply. I was just curious to know whether the “flying test” would have been for the benefit of Capt. Dunlop or for my father! I have put together a history of KN 304 (c/n 15809/32557), which apparently went to the Belgian AF in 1947, and the Katanga AF (Congo) in 1961, before crashing in April of that year. Let me know if you need more details. Great story. I have a digitized version of a 16mm film showing my 13 year old father taking a trip flight on PK-AFD from Batavia to Bandung and back. He would later fly with the 18th and 19th NEI Squadrons during and after the war before joining KLM in the Netherlands. Sorry to reply so late John. It must have been a grand adventure for your father to fly from Batavia to Bandung in a Fokker F-7. I still remember my first flight in a rattling De Havilland DH-104 when I was 10 or 11 years old. One will never forget that first time in the air. Your dad must have had a lively time during the war. The 18th sqn was off to a rather bad start – I wrote about that – but they performed all right. Thanks for reading my blog – hope you will like my future posts.